Amy Tragert taking a sample. LEA’s summer internships are paid positions geared towards motivated and responsible college students with environmental or educational interests. Interns are required to complete a variety of tasks and work with many different individuals. The work environment is casual but busy and about 50 to 60 percent of the work is outdoors. 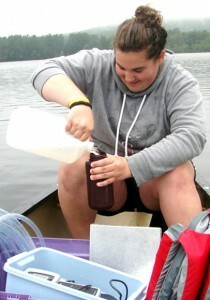 Water-testing interns are responsible for monitoring and collecting water samples from 40 lakes and ponds in the area. They work in teams of two, paired with another intern or a volunteer monitor. Interns test the clarity of the water using a Secchi disk, record oxygen and temperature values throughout the water column, and collect samples to test for chlorophyll, phosphorous, alkalinity, pH, conductivity, and color. They bring the samples to the LEA lab and prepare the chlorophyll and phosphorous samples and transport them to the Health and Environmental Testing Lab in Augusta. The interns run the remaining physical and chemical analysis at the LEA lab. The information is then entered into the master database. Interns must be comfortable in a canoe and able to swim, as they will spend a good portion of their time on the water. Water testing is the primary duty of the summer interns; however, some facility maintenance, trail work, courtesy boat inspecting (for invasive plants), and educational programs are also required. All training will be provided during orientation. The hours are generally 8 a.m. to 4 p.m., Monday through Friday, although some nights and weekends may be required. If you are a college student studying in the field of natural sciences and are interested in a summer internship with LEA please call 207-647-8580 by March 1. Driver’s license and access to a vehicle is preferred. Milfoil crew members remove the invasive plant variable leaf milfoil from the Songo River in Naples with the aid of a suction-harvesting boat and occasionally deploy benthic barriers. Tasks include hand-pulling the plants under water, bagging plants, collecting plant fragments, disposing of plants, conducting plant surveys, monitoring diver safety, educating boaters on the threats of milfoil and light boat and engine maintenance. Crew members also may occasionally be asked to assist summer interns in water testing. Hours are 8 a.m. to 4 p.m., Monday through Thursday with occasional Fridays. Applicants must have diving experience and be comfortable spending three to four hours in the water at a time. They must also be able to lift 50 lbs. and operate a motor boat. If you are a college student studying in the field of natural sciences and are interested in a summer job removing milfoil with LEA, please call 1-207-647-8580 by March 1. Driver’s license and access to a vehicle is preferred.